If I remember right, there used to be a White Castle on Rockaway Blvd, just off Liberty Avenue in Queens, NY, and they actually had car hops there too. To summon them, you would turn on your headlights. Vanilla cokes . . . yes!!! I couldn't wait til I was 16 and got my drivers license. One of the first places I went to was 'Bob's Big Boy'. Just had to have the Big Boy burger and a vanilla Coke. The waitresses were always pretty cute, and it was fun to steal the numbered card that they put on your car. My buddy drove a station wagon with a powered rear window. He would roll the window down so that the placard would go down inside the tailgate and after leaving, stop and roll the window back up to recover it. 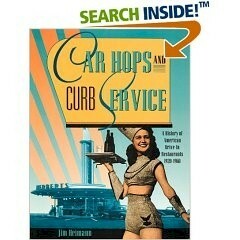 I did enjoy the drive-in, carhop service. In 1971, I went to Ft Gordon, GA. for communications school in the Army, one weekend, I went into Augusta to have a look around, and low and behold I found a 'Shoney's'. Same place, different name, wow, back to carhop heavan. Now I guess 'Sonic' is the current, and only carhop palace, but it meets my approval. My sister's first job was as a carhop at Bridgeman's Ice Cream - a small chain of drive-in/sit-down restaurants in Minnesota. No roller skates required though! My mom was a carhop at The Chicken Box in Pensacola, Florida in the 1970's. I remember her saying how nervous she became when toting those metal trays to the customers when lightning was popping all around her.